Anthropology is the study of humankind's origins, development, customs, and beliefs. This department maintains and researches the collections relating to these areas for use in exhibits, research, and programs. Material from Africa, the Pacific, and the Indigenous Americas are included in the collection as well as European and Middle Eastern archaeology. The Anthropology Department was one of the first departments to host interns at MPM, and continues to be one of the pillars of this program. Anthropology interns typically assist with collections maintenance and documentation of cultural collections, but they also do research on artifacts, assist in special exhibit planning and programming, and much more. Typically, Anthropology Interns are Junior or Senior undergrads, graduate students, or recent graduates within one year of graduation. 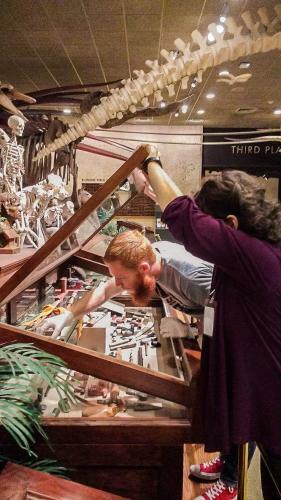 Previous experience working in museum collections is preferred, but applicants will be reviewed on a case-by-case basis taking into account available projects for the semester. Each internship in the Anthropology Department is tailored to the needs of the Museum as well as the interests of the interns. When submitting your cover letter, please specify your particular areas of study, availability, and what skills you hope to gain from an internship at the Milwaukee Public Museum.